A good way of paying for your Shopping trip as well! Mystery Shopping is a good little earner because you can often fit it in with other things and you are usually given a choice of dates to do it on. Basically it's gathering information about a companies retail outlet, petrol station, restaurant, hotel or other foramts. This information is gathered for obvious purposes of correcting weak service sales areas, style of customer care and geographic details etc. Let's take two examples 1. a fast food retaurant and 2. a retail outlet. You are given a few dates to choose from specifying a time of the day. You download a form from the Mystery Shopping comapny web site which is in the form of a tick sheet / scorecard and space for comments. 13.What was the best and worse part of your experience. There's going to be about 20 - 30 questions altogether. You go home, fill out the online form and that's it ! These are often combined with taking something back for a refund. Most points are similar to above and you make the purchase. You may be asked to take the item back after 2 / 3 days and ask for a refund and report what they were like, if they offered you alternative products etc. If a refund is not part of the mystery shop, you are given the choice of keeping the item (which you pay for) or sending it back. Fee; About £6 - £10 for the job and the product negotiable. The positive about this is that you can often tie the job in with the day you were going down town anyway, so you could get your shopping day 'free' in the sense that you've had a meal out and got your petrol money back and so on. The petrol station jobs are often the reimbursement of the petrol only, like you buy £10 worth of fuel and just get the money back. Hotels would be nice to get into. 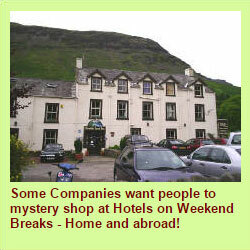 I've heard of weekend breaks being paid for in return of the questionnaire. It's not Big money, but it's another option and string to your bow. It's the pennies which make the pounds, the cents which make the dollars and this kind of work with a few other things can at least add a wee bit to the bank balance. Not all Mystery Shopping Companies pay cash, they give you vouchers or enter you into prize draws. Take the cash only ones!